Oasis can handle your home window washing needs. We are experts at residential window cleaning. Isn’t your home worth the investment of using Oasis to have clean windows year round? After all our services really truly is about window washing and getting your windows the cleanest they can be. We invest tons into our staff. 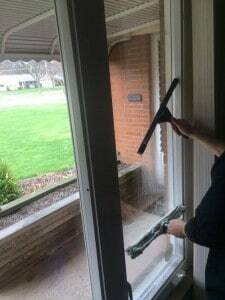 They are trained on the latest window cleaning techniques and each new employee is required to to work with an experienced member of our staff for 3 months before they are released into the field on their own. They are trained daily and at the end of their training they take a test to make sure they have everything down pat. We even train our workers on customer service and how to best service our customers. With Oasis, you are always sent a professional worker and even when you call the office you get nothing but the best. This is because we take our business seriously and want to succeed. They only way we can succeed is by making sure our customers love us and get nothing but the best. If your windows don’t shine then we haven’t done our job correctly. We go to great lengths to make sure each and every job we do is perfect. This is part of our sparkle clean guarantee. However, we know everyone has different needs. If you are unhappy for any reason, we will work right away and hard to make sure you are delighted with us. We are always on-time for any home window washing job. This is part of our professional guarantee. You set the time and we’ll be there usually about 10 minutes ahead of schedule. When you call Oasis windows, you are truly the king & Queen and will be treated as such. Don’t believe us? Call and find out, you’ll be surprised and feel great that you did. Oasis home window washing is one of the services we do best and are delighted to service your home We can clean your windows inside and outside, just let us know what you need and we will get your windows squeaky clean in no time.